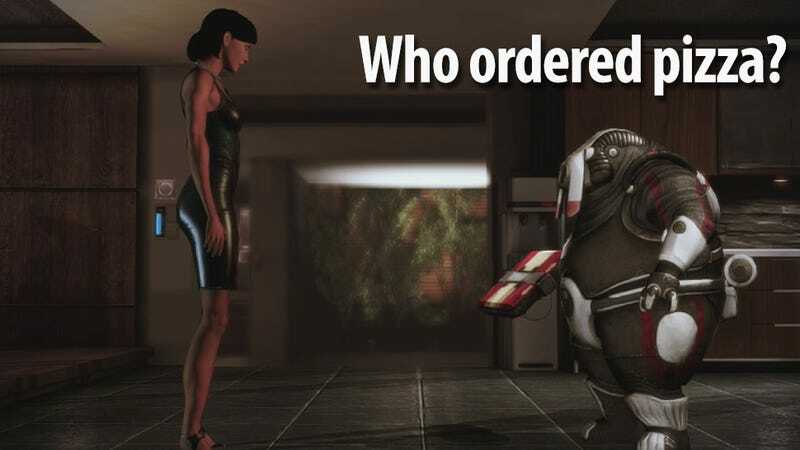 Citadel, the final downloadable add-on for Mass Effect 3, is a hell of a good time. It's so full of jokes, references, call-backs and gags that it's difficult to keep up. Plenty of people have been taking to YouTube and elsewhere to share their favorite moments from Citadel, and I thought I'd take the opportunity to share four of mine. Of course, it was Vega, because Vega is totally the dude who would order pizza during an important mission-briefing. Aah, the moment when a guard realizes he's just a guard in a video game. A sad moment, indeed. While this doesn't quite match the brilliant enemy dialogue in No One Lives Forever, it made me chuckle. I also enjoyed the whispered banter leading up to it, particularly how Garrus pronounces "Sorry." Of course, it wouldn't be a funny Mass Effect episode if they didn't get in one last elevator joke. I feel you, Garrus—I miss those elevator rides, too. Easily my favorite bit from the entire thing, and the moment when I realized just how much fun the rest of Citadel was going to be. There were plenty of other great moments in Citadel, but those were probably my four favorite. My video-capture software lost the bit where Specialist Traynor's toothbrush saved the day, though that was certainly another highlight. Also, Tali was dead on my playthrough, so I missed her hilarious musical interlude, and I haven't seen all of the other unique character interactions yet, either. If you've got any of your own favorite moments, I hope you'll share in the comments. It was fun, Commander. Thanks for the laughs.